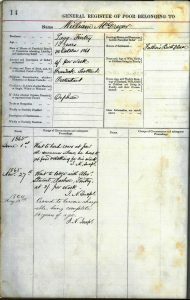 The register of applications for poor relief in Fintry Parish indicates that William McGregor was first accepted on to the poor roll in 1861. That register gives very little detail about William’s circumstances apart from the fact that both of his parents are dead. Some entries in the poor relief records are very full, some less so, but even this small amount of information helps us build up a picture of a part of this boy’s life. This is invaluable in the cases of children where very little other information about them survives. At the time of this entry in the register of the poor in 1865, William is 13 years old. Although he is not officially old enough to undertake regular work, he is considered suitable to work as a herd boy at a local farm during the summer. As the entry in the register of application states that he is eligible for support to go to school, it is likely that he was attending the local school during the rest of the year. 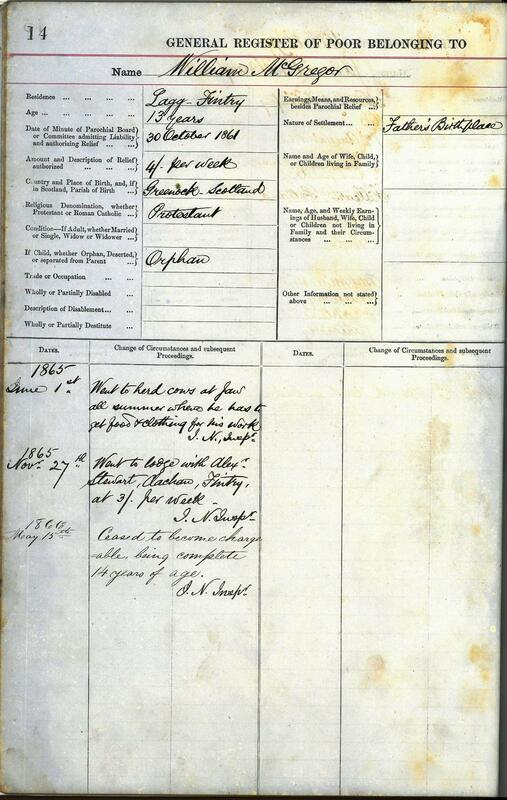 The register records that William is not from Fintry originally and that he was born in Greenock. However, because his father was born in Fintry, this is regarded as his place of origin and Fintry Parish are held as being responsible for his support after the death of his parents leaves him an orphan. After his summer living and working at a farm, where he was given an allowance by the parish for his food and clothing, in November 1865, William was sent to lodge with Alexander Stewart at a place called Clachan in Fintry, and the parish paid the 3 shillings a week to Alexander for his upkeep. It was quite common at this time for people to take in orphan children and care for them in a fostering style arrangement. Some people took in a number of children and this was vital in areas where there was no access to a formal children’s home. It is likely that William’s birthday was the 15th May for as soon as he turned 14, the Parochial Board relinquished responsibility for him as he was regarded as being old enough to work. Unfortunately, there are no details given of the work that William managed to find after this but, whatever happened, he was on his own and had to support himself, being regarded as an adult and able to work. This seems extraordinary to us now when children are legally obliged to be at school at this age. Life was very hard for orphaned children in the 19th century.